What are our pharmacies doing to manage medication shortages? 1. A dedicated procurement team analyse drug usage data to forecast requirements and manage ongoing supplies and advise where stock may require redistribution across the pharmacy network for equitable access 2. Automatic ‘second sourcing’ to find an available alternative brand to the out of stock drug 3. Identifying alternative sources - where there are no available brands with TGA registration, the procurement team works with agencies to identify overseas registered drugs and make them available under Special Access Scheme 4. Regular Communication: –– Drug-specific memos when supply issues are identified –– Stock status update emails 5. Researching and recommending clinical alternatives: –– The Pharmacy Practice Unit, clinical pharmacists (in consultation with specialist medical staff) provide advice regarding potential alternative treatments Given the multifactorial reasons for the medicine shortages there is no one-simple (or quick) fix. We can expect medicines shortages to remain a serious issue for the forseeable future. The key then is how to effectively handle the issue. A systematic approach to drug shortages when sourcing medications, in tandem with timely and effective communication from manufacturer through to clinical staff, is essential to support optimal patient care. Please contact your local pharmacist for further guidence. References are available on request. ¬¬ An increasing proportion of active ingredients is sourced from India and China. This supply has been inconsistent in availability and quality Example: piperacillin/tazobactam injections supply is severely restricted globally because one of the two sources of the active pharmaceutical ingredient had an extensive factory fire and cannot supply until mid-2018. ¬¬ Failing to meet TGA requirements/specifications ¬¬ Recalls, which then place pressure on the remaining brands in the market Example: recall of multiple batches of gentamicin injections due to excessive histamine content in October 2017 created a short term supply disruption. ¬¬ If one part of the manufacturing chain is affected there is little buffer to satisfy market demands ¬¬ Inadequate forecasting of supply requirements Example: Fentanyl earlier in 2017, the contracted supplier to at least three of Australia’s public health services was unable to obtain stock from their international source , forcing other suppliers to increase forecasts and ration / manage stocks for the entire Australian market at short notice. ¬¬ Issues with equipment, ingredients and packaging causes delay in supply Example: Major hack of Merck computer network as part of the global ransomware attack in June 2017 compromised the supply of the antiemetic aprepitant (Emend ®). interventions to prevent wound infection, such as the use of skin antiseptics. However, inappropriate use of SAP, in terms of prolonged duration and use of antibiotics with a broader spectrum than necessary, can select for resistant microorganisms, increase risk of adverse effects (such as Clostridium difficile-associated diarrhoea) and lead to higher costs. that will be encountered. Individual risk factors must also be considered for every patient and may alter dose and drug selection, e.g. immune suppression, presence of prostheses, allergies, obesity, diabetes, infection elsewhere, available pathology or malignancy. Environmental factors such as institution specific resistance patterns may also have a bearing on selection. organism to cause postoperative infection. The Australian Therapeutic Guidelines: Antibiotic recommends the avoidance of broad-spectrum antimicrobials, with first generation cephalosporins (e.g. cefazolin) remaining the preferred drug for the majority of procedures that require prophylaxis6 ¬¬ Correct timing of administration: ensures adequate tissue levels of the drug during the operation. Generally the antibiotic should be administered up to 60 minutes prior to skin incision and as a single dose. A second dose may be necessary if –– There is a delay in starting the operation –– A short acting antibiotic is used and the operation is prolonged (longer than 3 hours) –– Significant blood loss ¬¬ Correct duration: for most procedures, it is now only recommended to give one peri-operative dose of antibiotic prophylaxis. Postoperative use is specifically recommended for certain procedures (e.g. cardiac and vascular surgery or amputation of an ischaemic lower limb), however antibiotic prophylaxis should always be ceased within 24 hours of completion of surgery Non-antibiotic measures to reduce the risk of surgical site infection should not be ignored and include: optimal perioperative medical management, mechanical bowel preparation, adequate debridement, and good surgical technique. ¬¬ Improved availability of guidelines such as access on all computers, posters in theatre, lanyard-sized guides ¬¬ Review of current facility SAP guidelines by a multidisciplinary team including a surgical, anaesthetic, infectious disease physician/microbiology specialties. Guideline development should follow the Therapeutic Guidelines, however local issues such as antimicrobial resistance patterns may cause deviation. All local guidelines should be evidence based and endorsed by relevant hospital committees with regular review ¬¬ Consider restriction of broad spectrum antibiotics on imprest in operating rooms. Restricting supply of cefazolin to 2g vials may reduce the chance of under dosing ¬¬ Computerised decision support systems aimed to assist in correct antibiotic selection ¬¬ Audit of SAP (e.g. Surgical National Antimicrobial Prescribing Survey) with data, analysed and communicated to the surgical teams Correct management of SAP significantly improves patient outcomes and ensuring the use of narrow spectrum antimicrobials (targeted at likely infective organisms) for the appropriate duration can mitigate the risk of resistance and adverse effects. Once an antimicrobial stewardship (AMS) program is established in a healthcare facility, a focus on activities to improve SAP prescribing may provide the greatest benefit to tackle inappropriate antibiotic use. 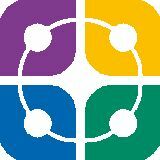 On a broader scale the Commission will be working with key stakeholders, including the Royal Australasian College of Surgeons and National Centre for Antimicrobial Stewardship, to identify strategies and policies that can be implemented at the local, state and territory, and national levels to improve appropriate SAP.7 References are available on request. What’s New Entresto® (sacubitril with valsartan) Emily Pacecca, Epic Pharmacy Murdoch and Shan Heynes, Icon Group Pharmacy Practice Unit Entresto® is a combination of a firstin-class neprilysin inhibitor (sacubitril) and an angiotensin receptor blocker (valsartan), indicated in adults for the treatment of chronic heart failure (Class II – IV) with reduced ejection fraction.1,2 It is usually administered with other heart failure treatments, in place of an angiotensin converting enzyme (ACE) inhibitor or angiotensin receptor blocker (ARB).1 Evidence is currently insufficient to recommend Entresto® as a first-line treatment for heart failure.3 Sacubitril prevents neprilysin from deactivating natriuretic peptides, whilst valsartan blocks the renin-angiotensinaldosterone system thereby promoting vasodilation and diuresis, and reducing myocardial fibrosis and hypertrophy4 (refer Figure 1). (NSAIDs) increasing the risk of renal impairment; monitoring of renal function is required on initiation of Entresto® and with dose changes. Careful monitoring of serum lithium levels is recommended for patients on Entresto® with lithium as increased lithium concentrations and toxicity have been reported with other ACE inhibitors and ARBs. Dosing Entresto® is available as sacubitril/ valsartan 24mg/26mg, 49mg/51mg and 97mg/103mg tablets. Note: 26mg valsartan in Entresto® is equivalent to 40mg valsartan in other products3 due to the valsartan contained within Entresto® being better absorbed by the body than the valsartan in other marketed products.2 Dosing usually starts at 49mg/51mg twice daily, doubling after two to four weeks to a target maintenance of 97mg/103mg twice daily, as tolerated.2 A lower starting dose of 24mg/26mg twice daily should be considered for those with risk factors for hypotension (SBP 100-110 mmHg), patients not currently taking an ACE inhibitor or ARB, or on a low dose of these agents, elderly patients, and patients with severe renal impairment or moderate hepatic impairment.2,3 In a large clinical trial, Entresto® proved to be superior to treatment with an ACE inhibitor alone, however there are some limitations with the study that warrant further investigation: the comparator ACE inhibitor was not at maximal tolerated dosing, and a patient who completed the study may not be representative of the general heart failure population. There are numerous other clinical trials underway or in development at the moment. This novel treatment may become first-choice therapy in the future however, at this stage, available evidence only supports its use in patients stabilised on an ACE inhibitor or ARB, in combination with other heart failure medications.6 References are available on request. 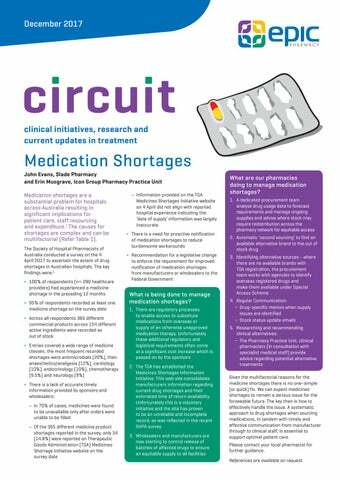 If you have any queries regarding Circuit content and authors please contact the Epic Pharmacy Practice Unit by email: circuit.editor@epicpharmacy.com.au Every effort has been made to ensure this newsletter is free from error or omission. Medication Shortages, Surgical Antibiotic Prophylaxis, New Drug Brief: sacubitril with valsartan.